Netflix’s animated series BoJack Horseman recently premiered its third season, and already the titular character has been added to the list of great television antiheroes. AV Club’s Danette Chavez compares BoJack (Will Arnett) to Tony Soprano and Don Draper. Despite being a horse at the center of a comedy, BoJack isn’t very different than the main men in these dramas, who experience life possessed by power, intellect, and ability—but who also have a depressing tendency to turn everything they touch to stone. For BoJack, season three is about dealing with the worst thing he’s ever done: nearly molesting the child of his close friend. 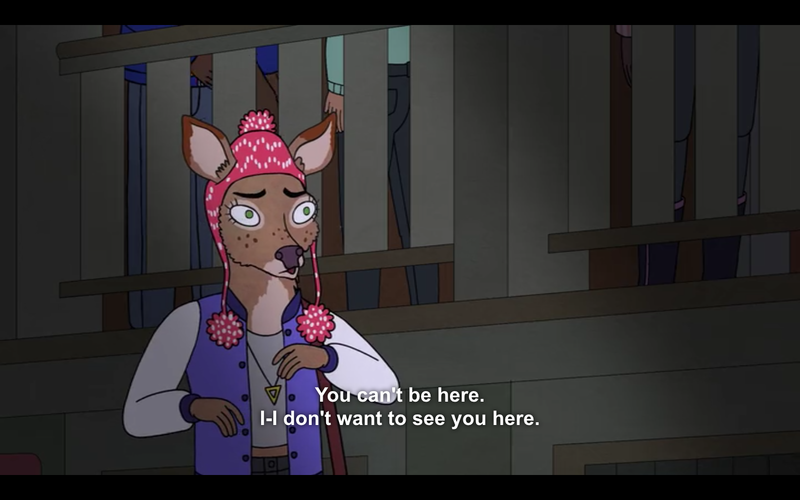 In season two, BoJack abandons his movie job and runs away to New Mexico to visit Charlotte (Olivia Wilde), a free-spirited deer who he met during his days as a TV star. The epithet of everything BoJack wants to be, Charlotte is stable, happy, beautiful, sober, and has a family who loves her. Their problems are almost as easy to solve as the ones BoJack dealt with in twenty-minute episodes of Horsin’ Around. After two months of living with her family, he confesses his love for Charlotte and begs her to run away with him, but she rejects him, telling him that he makes her sad. Wounded and inebriated, BoJack ends up alone in a bed with her seventeen-year-old look-alike daughter, Penny (Ilana Glazer). The interaction is stopped only by Charlotte interrupting them and banishing BoJack from her life—and her daughter’s life—for good. 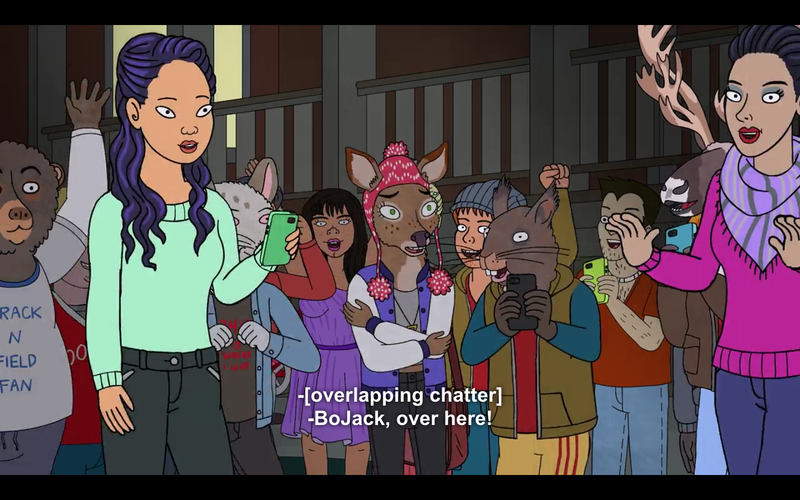 BoJack with Charlotte’s family. Source: Netflix. The child molestation jokes present throughout BoJack’s third season might come as a bit of a surprise to lovers of the show. 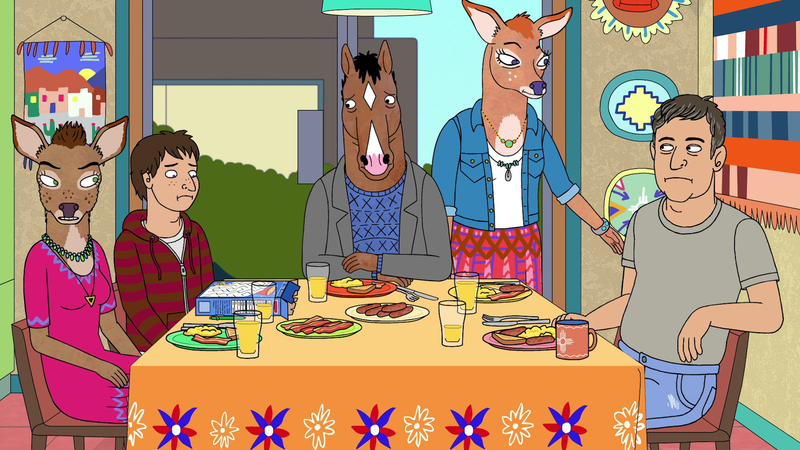 Overall, BoJack Horseman takes a liberal lens to politics and humor, choosing to punch up instead of punch down. Yet, suddenly, we have an onslaught of jokes about child abuse. In episode one, BoJack’s publicist says that it’s “no big deal, movie stars do it all the time.” Later, a former Horsin’ Around co-star describes his new hometown as “B+ [overall], B- children.” At one point Diane gets weirdly defensive about “valuing” her nieces and nephews for their looks. Each of these scenarios, and the many more that happen throughout the season, are set up as jokes with a punchline, but the punchline is always about a child getting hurt. On my first watch, this seemed horrifying, for reasons as personal as they are political. When I was eleven, my neighborhood was torn apart because a man on my street molested a girl who lived down the block. I witnessed her ostracism. I witnessed his family’s denial and then subsequent decomposition. Now I live in Los Angeles, where BoJack takes place. I attended a college with a very successful reputation of getting its alums hired in entertainment. The idea that pedophilia is just a joke to the people in the city where I live—and could be just a joke to the people I went to college with—is horrifying. After each joke, I felt betrayed that my favorite show was making me think about this prospect. The humor in BoJack moves quickly, so you only have a second to be disgusted before it’s on to the next punchline. But as the season progresses, the jokes become more and more obvious, culminating in the penultimate episode when a family literally offers up their own child to BoJack for a “sleepover,” hoping that this will be their “big break.” It’s a gross scene, set up as a skit but landing as a warning, with the child in question looking close to tears the entire time. It comes in the midst of a months-long drunken road trip BoJack embarks on with his last friend, Sarah Lynn (Kristen Schaal). BoJack has not only slept with Sarah Lynn in their adult lives, but she also describes him as a “sexually inappropriate father figure” during their time on Horsin’ Around, back when she, too, was a child. This episode also follows BoJack’s weak attempts at making amends, so halfway through the bender, BoJack attempts to find Penny. He and Sarah Lynn drive all the way to Ohio, where Penny now goes to college. In between various substance-induced blackouts, we watch BoJack follow Penny through her campus. She goes to the library, has lunch with friends, and attends a party. She looks like a normal college student with no worries. But instead of being satisfied with this, BoJack lets the desperation (or drugs) overtake his good judgment and approaches her as she leaves the party. Immediately Penny recoils from him, horrified at his presence. BoJack pursues her anyways, only to be caught in the spotlight by other party-goers. “Hey look, it’s BoJack Horseman!” one shouts, and the teenagers surround him, ecstatic to see a famous movie star on their campus. Penny disappears into the crowd. While we spent the entire season following the BoJack’s Oscar campaign trail, Penny’s horror makes it clear that she spent the entire season avoiding it. It’s worth noting that BoJack never reached the point of physical abuse with Penny. It’s also worth noting that he was stopped only by her mother walking in. His (almost) actions and their repercussions haunt him, and not all of it is self-serving pity. Did he destroy the family? Did he destroy the girl? Would he have actually done anything if Charlotte hadn’t walked in? Was he really the monster he thought he was all along? And would his monstrous actions have been—as the various jokes throughout the season seem to suggest—normal? When he finally approaches Penny, he gets his answer. Nothing about this is normal, and yet, so much of it is. Although she isn’t a child of Hollywoo(d), she was hurt by a powerful, irresponsible man who could leave her behind and return to a community that would protect him. 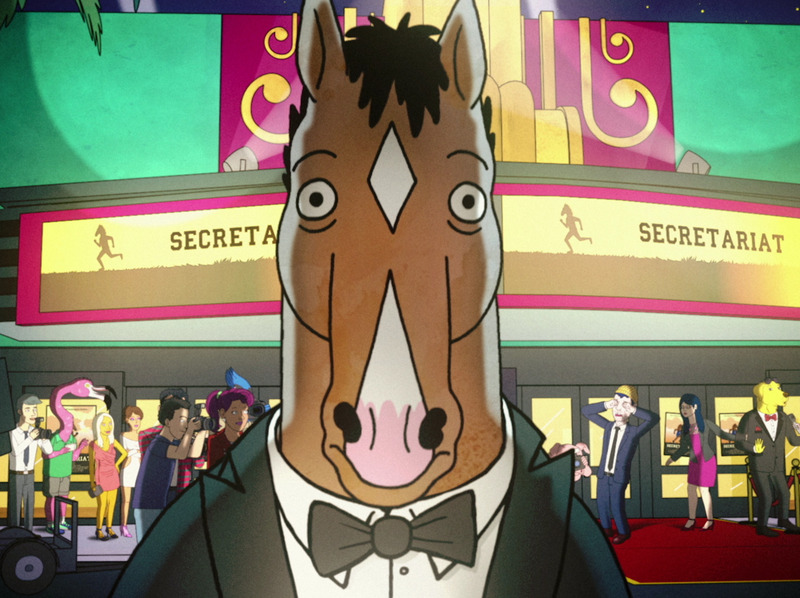 Though the show’s mission is in part to satire Hollywood, BoJack himself shouldn’t be taken as a perfect metaphor for all powerful, corrupt people in the industry. He’s too specific of a man (horse) to be a metaphor the way other side characters have been. In true antihero fashion, BoJack’s own shortcomings drive him to self-awareness. Inserting crude jokes about Hollywood’s child victims in order to bring the audience to self-awareness alongside BoJack was a bold decision on the part of the writers. If the jokes rang tasteless, it’s because they were. It’s because they come primarily from the same mouths that validate and idolize BoJack, like his publicist, journalists, former coworkers, and friends. But, as it has done for two seasons before this, BoJack Horseman never forgets to show us the consequences.